Until recently, Radiology has played a small role in the developing arena of global health. There is much to gain in terms of educational and professional development from reciprocal exchange of education and imaging applications between institutions, students, residents, and physicians in the underdeveloped world and those in developed nations. The mission of this program is to provide an enduring educational exchange between the Department of Radiology and Medical Imaging at the University of Virginia and underserved international health care organizations. Our vision is to have an established and sustainable health care education elective for UVA radiology residents that positively impacts both the Residents-in-Training and underserved international communities. In his 20 years overseeing the UVA Radiology Residency program, Dr. Spencer B. Gay went above and beyond to develop both the program and the residents. Formed in his honor, the Spencer B. Gay Program was born from a growing interest in international work among UVA Radiology residents as well as a desire on the part of lead faculty for residents to have the opportunity to “give back” on a global scale. In 2013, several global health initiatives coalesced across the department at once. Around the time Spencer B. Gay was returning from a service trip to Cambodia, resident Rebecca Gerber received a scholarship from the American College of Radiology to do international work in Rwanda. At the same time, Department Chair Dr. Alan Matsumoto was also working to provide international education to a group in Kuwait. When Dr. Gay announced his retirement in 2014, Dr. Matsumoto saw the opportunity to create an enduring program for residents to fulfill this international education need. Ultimately, this combination resulted in the creation of the Spencer B. Gay Program. While the program is still evolving, the mission to build sustainable ongoing relationships with international partners is firmly established. UVA Radiology Residents-in-Training: Will have the opportunity to experience a more diverse array of pathology, and learn alternate methods employed in the diagnosis and treatment of such entities in the setting of limited diagnostic imaging resources. This program will not only enable the exploration of conventional and alternative imaging methods, but will also allow the radiology resident to think creatively, work efficiently and become adept at resource allocation and management. Host Nation Students/Residents/Physicians: Will acquire insight and training in diagnostic imaging and image-guided therapeutic procedures tailored to the needs of their community and patient population relative to available and sustainable resources. The program will ensure them access to fundamental learning tools such as: review articles, web-based learning modules, and video conferences led by US-trained staff. The Spencer B. Gay Radiology Resident International Education Program will be based on the Global Health Leadership Track of the UVA Center for Global Health. The track is designed for second to fourth year diagnostic radiology residents interested in global health initiatives and the impact and applications of diagnostic imaging and image-guided interventions in international institutions and communities with limited resources. For more information about our Radiology Residency program and available tracks, see UVA Radiology Residency. Year one of this track will coincide with the second year of radiology residency. Continuing imaging training in the third year of residency will prepare the radiology resident to serve effectively in a foreign medical situation. General activities and courses will be provided by the UVA Center for Global Health’s Global Health Leadership Track (GHLT). We aim to implement additional didactic imaging activities in order to provide radiology residents with knowledge and skills that will facilitate a bidirectional sharing of ideas and knowledge between UVA and international institutions. The activities proposed are also intended to provide participating radiology residents with competencies that will not only prove useful in the context of global health promotion and outreach, but will also serve as an integral foundation upon which to base future careers. Videoconferences between UVA residents and faculty and partner institutions, with emphasis on educational forums and lectures. Case-sharing and remote diagnostic consultations for difficult cases – including case planning, follow-up and discussion. This interaction is intended to promote an atmosphere of collaboration and camaraderie between the two institutions. It will also give UVA participants an idea of the diversity and spectrum of cases in the country in which they are working, and the challenges encountered in a resource-limited environment. The track will be configured to provide the resident adequate time to gain proficiency in ultrasound prior to participation at the partner institution. Basic non-radiology lectures on tropical medicine and global health to give radiology residents a cultural context of the environments in which they will be working. The UVA Center for Global Health’s Global Health Leadership Track (GHLT) is a program available to residents in the Internal Medicine, Family Medicine, Pediatrics, Surgery, Radiology and Emergency Medicine Residency Programs. The GHLT prepares physicians to become leaders in global health practice, research, policy and education. As the first participants in the SBG program, Connor Louden and Ally Baheti had the powerful and challenging opportunity to set the course of the program for years to come. 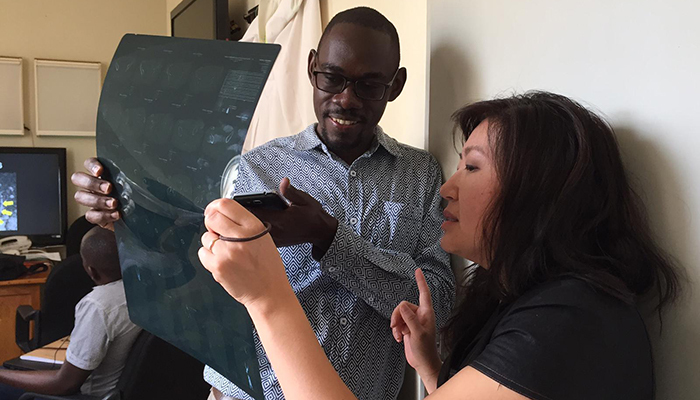 They quickly recognized that instruction for the radiology residents in Uganda was a huge need, and they stepped in quickly to fill the gap. This global health program is unique in the country in that it focuses on ongoing instruction of residents rather than primarily on direct health care.